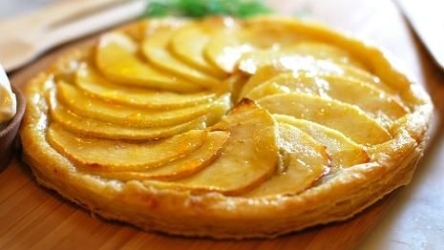 This Apple Tart is a British food recipe made with a puff pastry. Reserve one cup of milk. Boil the rest of the milk with cinnamon, lemon and sugar. Stir continuously to prevent sticking. When the milk boils remove from the fire. Mix the separated cup of milk with 3.5 ounces of corn starch and yolks, beating vigorously so everything is well dissolved. Remove cinnamon and slowly add the yolk and cornstarch mixture, stirring. Beat vigorously with the whisk and let stand until cool. Grease cake pan with butter. Add puff pastry to pan. Cover the puff pastry with the cold cream. 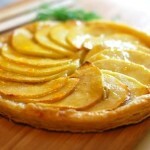 Add apple slices over cream overlapping slices slightly. Sprinkle the apples with butter pieces.